This article was donated by AJ and is inclusive of some of my own former research with fluorescence body markings following alien abductions. “Less common types of fluorescence emit in the red-pink (hot pink) region and are found primarily on the hands, fingers, palms and neck region of abductees. These abductees report handling and cuddling of infant alien/human hybrid creatures. This is also subdermal. The photo on the top (wrist) is that of a three-year-old. Note the orange-pink color of the child’s wrist. This close up reveals the overall shape of the mark and it appears to depict an unusual symbol. The child’s family has a history of abduction experiences and one of the child’s parents remembered an encounter the previous night. This is a potentially disturbing reminder of how young humans are when their first interaction with these Beings occurs. Over the past 10 years, it appears, at least from the number of images available on Internet research sites, that the color blue may have increased in prevalence. This could also be due to the fact that more abduction experiencers are taking a proactive role in their own investigations and are simply finding more marks and substances on their bodies that fluoresce under ultraviolet light. In any case, the blue-white spectrum appears to be observed more today than it was 10 years ago. 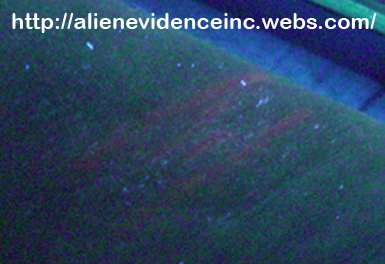 The photograph below shows a similar blue substance on the hand and thumb of an abductee. 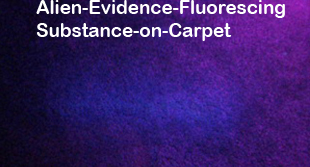 As is the case with the other substances, it is not visible under normal lighting, but fluoresces blue under UV illumination. Another scientific professional who is researching fluorescence findings and performing scientific analysis on samples – as well as alien implants – is Alien Evidence, Inc.
Dana Lilith is an abduction experiencer who has written and posted about similar markings on her blog at http://www.ufochick.com/ She has a few photos posted here http://www.ufochick.com/entries/2009/5 but you will have to scroll down the page to view them. Other photos are posted here http://www.ufochick.com/entries/2009/6 – again, scroll down the blog page to view the images.